Actually a craft show come flea market. Chatsworth is a village in the center of the massive New Jersey Pine Barrens. Actually it’s the largest village in this massive 3,000 square mile area of pine forest, swamps, cranberry bogs and blueberry fields. For most of the year it’s a small quiet village of about 800 people but one weekend in October it explodes with people. 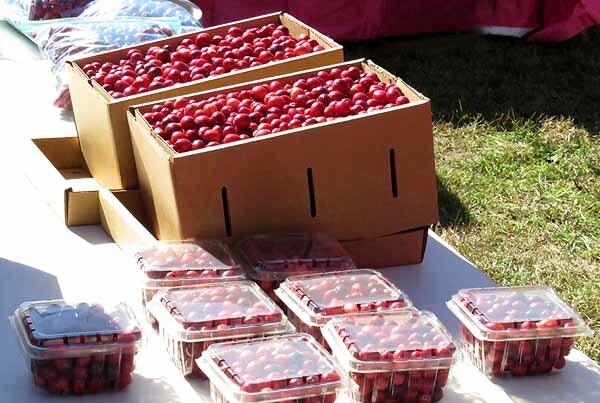 This festival has grown from humble beginning as a actual cranberry festival to a huge ‘craft’ show. It has been years since we last attended the show, at least 15 maybe more. This year we decided to take another look. The event begins at 9 am and being early birds we decided to get there when it opened. We knew it would be busy and parking is always a problem. We arrived at 9.03 am and the place was already thrumming. There were people everywhere with locals jumping up and down trying to get you to park on their little side street or front lawn for $5.00. We opted to drive farther into town and park in the local school. The website said that the parking here would be $5.00 but it had changed to $10.00 by time we arrived. Checking online after we came home seems from what others have said that this is a common yearly practice. Still it was closer instead of hiking half a mile from the earlier parking options. Obviously a lot of other people decided to start early too. The stalls were all busy, and there were a lot of them. Every square inch of the main street in this little town is covered in vendors. They cover parks, open lots and cram onto the front lawns of the houses, it seems everyone in the village gets in on the act. Its certainly grown a lot since we were last here, but sadly the concept of the ‘cranberry festival’ has been demoted to almost but not quite yet non existent. When the festival started in 1983 there was much more of a cranberry theme. When we first attended back in the mid 1990’s it was still strong. By that time the parade had gone, too many people in the way, but there was still a lot of cranberry theme in the event. There was a cranberry show which highlighted the different kinds of cranberry and cranberry competition for best all around. There was a photo contest, a recipe and tours of the local cranberry bogs to watch the cranberries being harvested. One corner of the town was piled high with boxes of fresh cranberries which were sold by the scoopful. It was small town America at its best. Today things are very different, gone are the competitions, the cranberry tours, and this year the recipe and photo contests were eradicated. 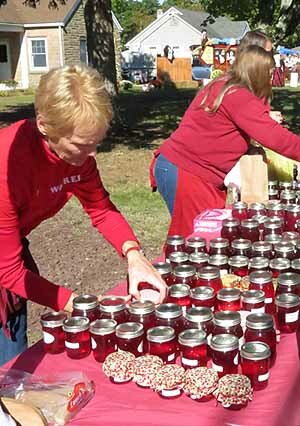 There are still a few people selling cranberries along with cranberry preserves, cranberry chili sauce and a cranberry baked goods but they need to be sought out. Most are clustered around the White Horse Inn which is the center of the town and the vendor check-in point. 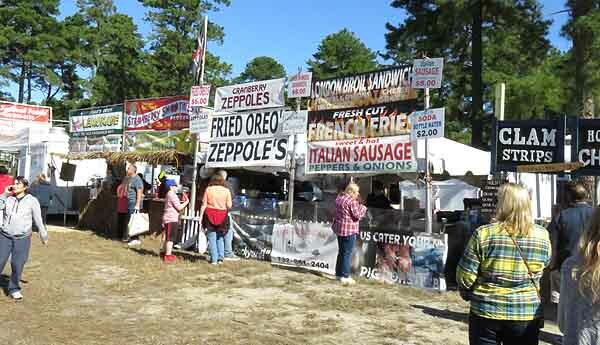 Most of the ‘festival’ is just one giant craft show. Festivals.net one of the best sites for craft vendors reports that there are 150 craft spots with 14 food vendors. It also reports that the show is juried, which usually means that vendors have to have decent quality before being allowed to exhibit. This might be true for part of the show and there were some fairly decent craft booths in one portion of the show. However the rest of it is more like a giant flea market than a craft show. This section is obviously not included in the 150 craft spots and there are way more vendors that this in attendance. However there is an enormous amount of buy/sell merchandise on sale. There were also way more than 14 food vendors. This was certainly needed since 14 vendors could not possibly have handled the massive throng of people attending the show. There are at least two specific food vendor areas with other vendors dotted around as well. One area has food vendors in circle with picnic tables in the center and a stage with live music at one end. This was the only stage that we located during this years festival. The number of people estimated to attend is high, Festivals.net stated reported 75,000, this is the number stated by the organizer. However many articles written about the event including one by the New York Times from way back in 1997 gives an estimate of 100,000. So its hard to believe that the number has not increased greatly since that time. There was certainly a much larger crowd there than the last time we attended. 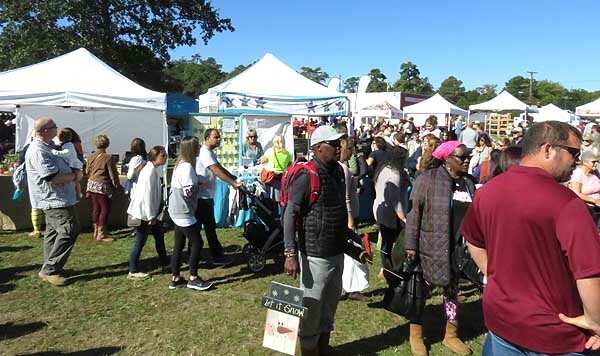 Its obviously something for people to do on a sunny October day and its promoted as one of the most attended festivals in New Jersey. The weather this year was wonderful, bright sunshine all day long. It started off cool and coats were needed during the first section of vendor exploration, and at this point a coffee would have been nice. However by time we had ambled through the crowds to the vendor selling coffee it had warmed up so much that the coats were returned to the car and ice cream was more the desired food. A local vendor outside the White Horse Inn claimed to be selling cranberry ice cream but sadly it turned out to be more of an artificial tasting water ice come sorbet with far to much what tasted like artificial sweetener in it. Everywhere there were people carrying large parcels and oddly shaped items from purchased from vendors. If you come to the festival bring plenty of cash. Chatsworth’s location in the center of the pine barrens means there is no cell tower close and cell phone coverage is spotty and limited. Most vendors who do take credit cards cant because they are unable to get a signal. Keep your family together as calling the lost member and arranging a meeting spot is impossible. I saw many people attempting this and becoming agitated with no signal and being unable to contact lost family members. Interestingly information on what happens to the proceeds of the cranberry festival are sketchy. 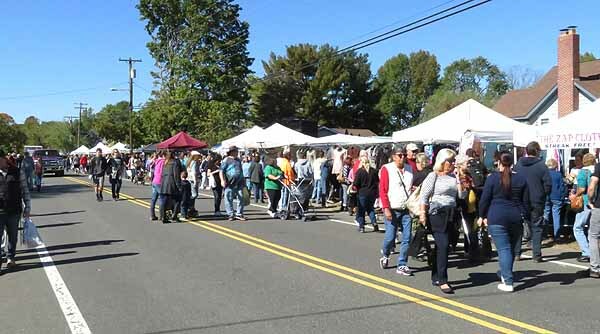 The festival itself is run as a non profit organization and the brochure that the festival puts out, which has no information about Chatsworth or anything to do with the village at all, states briefly that the ‘proceeds go to benefit the White Horse Inn’. Checking the festival website produces no more information about the White Horse Inn or what its for at all. A little more investigation reports that the festival was started to raise funds to restore the White Horse Inn which was in a very bad state of repair. The project was awarded a grant of $45,668 in 1991 from the New Jersey Historic Preservation Bond Program to help with restorations. A New York Times article from 1997 reported that Ms. Mary-Anne Thompson an environmental lawyer who helped found the festival in 1983 as an educational, agricultural and cultural celebration of the Pine Barrens estimated that it would take an additional $100,000 to turn the White Horse Inn into a Pinelands museum and senior center. An article published in 2008 by NJ.com stated that the renovation cost was now at $800,000 and restoration was still not complete. Most of this money has been covered by the proceeds from the cranberry festival and of course the grant. The New York Times article reported that the festival was estimated to gross over $100,000 per year at that time (1997). It’s hard to understand how restorations are not completed by now, some 33 YEARS after the project was first begun. It’s also hard to understand why all the money from the festival is still going to fund this restoration and why there is so little information about the Inn, its purpose or anything about the suggested museum. More recently the other historic landmark the General store known as Buzby’s has come up for sale. The current owner Marilyn Schmidt bought the place in 1998 when she was 67 years old. At that time the place had been vacant for seven years and was in a very decrepit state. The old building built in 1865 needed to be gutted to the walls and restored to its former glory. This was achieved a matter of a few years and Schmidt has operated the store for the past 18 years. Now at aged 87 she want to retire. The store which is the only one for at least a 10 mile radius is a landmark. Sadly there are no takers to purchase the store which has been on the market for at least two years. The amazing thing to me is that one old lady (with help of course) can completely restore a building and have a store running in only a few years while the White Horse Inn with masses of funding from the Cranberry festival is not completed after 33 years. If Chatsworth is so concerned about its history and heritage why not use some of the funds from just one year of the festival and buy the general store to add to their historic collection and allow this valiant, courageous proud American lady to have a good retirement. 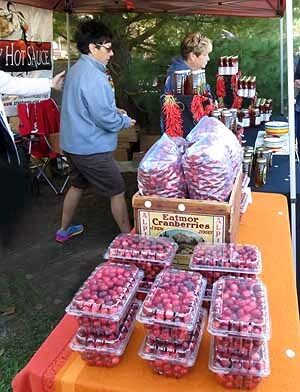 Author Janice Hazeldine PhDPosted on October 17, 2016 Categories out and aboutTags cranberries, cranberry festival, enjoy our world, entertainment, festivals, new jersey, new jersey scene, out and about, things to doLeave a comment on Chatsworth Cranberry Festival.